VALERYAN’S fifth album which is called Groovy Reflections has been produced in conjunction with USA based internet radio station of the same name. The album is to be released on 20th October 2017 and on that date it will be available for download and streaming from I-TUNES, Amazon and all major download stores worldwide. 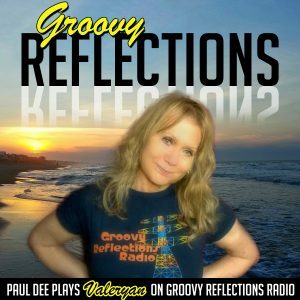 Groovy Reflections album has 22 tracks and all have been played by Paul Dee over the last few months on his radio show “My Front Porch” which goes out daily, worldwide, on the USA internet radio station. Thank you to Paul Dee of USA’s Groovy Reflections Radio for having played Valeryan‘s a capella version of the Irish Traditional song She Moved Through The Fair as part of their celebrations of St Patrick’s Day. Paul’s show ” From My Front Porch” goes out weekly with daily repeats and has featured 11 of Valeryan’s released recordings during the past 13 months. This week Valeryan’s track Summer Festival Blues appeared for the first time in the Top 40 on South Africa’s internet radio station ZONE RADIO. The track is currently in at no 24 and all the while it’s in the charts it’s getting more and more air play. This can’t be bad so let’s help it go up the charts over the next few weeks. The track is included in the album July 14 which is available from I-TUNES https://itunes.apple.com/gb/album/july-14/id1062379018 along with a further Valeryan originals written since 2014. 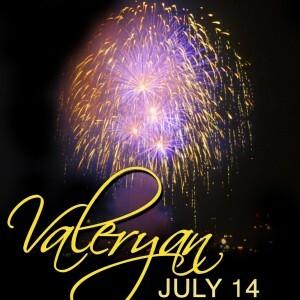 Once again USA internet radio station Groovy Reflections is featuring some of Valeryan’s tracks. 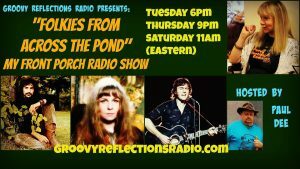 This week the theme of the show From My Back Porch is Folkies from Across the Pond. Presenter Paul Dee, who featured two of Valeryan’s tracks on his show back in January, has added Long Black Veil and The Kat Song from Valeryan to those of Cat Stevens, the late Sandy Denny and Ralph McTell…. Mary Black, Donovan & The Watersons This is quite a distinguished line up to say the least to those of you old enough to remember …..